9 Fruit cake bites with marzipan filling, decorated with flaked almonds and dipped in rum butter. 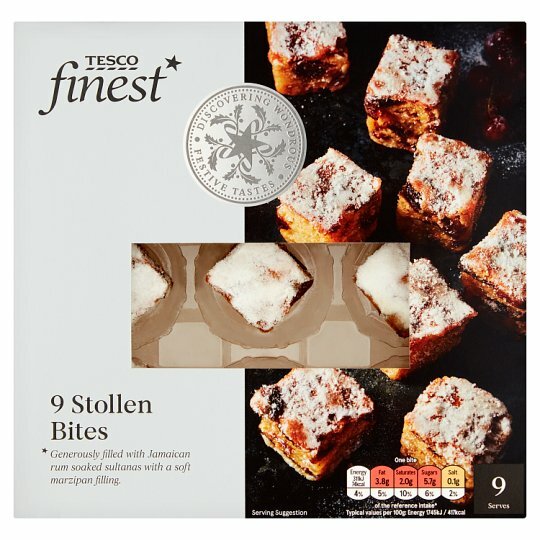 Deliciously rich Stollen pieces dipped in rum butter and packed with succulent sultanas and glacé cherries, with a soft, sweet marzipan filling. Hand decorated with almonds and dusting sugar. INGREDIENTS: Sultanas (19%), Wheat Flour (Wheat Flour, Calcium Carbonate, Iron, Niacin, Thiamin), Marzipan Filling (15%)(Sugar, Almonds, Water, Dried Egg White, Invert Sugar Syrup, Alcohol), Rum Butter (14%)(Butteroil (Milk), Rum), Glacé Cherries (7%)(Cherry, Glucose-Fructose Syrup, Sugar, Colour (Anthocyanins), Citric Acid), Water, Almonds (2%), Dextrose, Yeast, Sugar, Palm Oil, Rapeseed Oil, Candied Citrus Peel(Orange Peel, Glucose-Fructose Syrup, Lemon Peel, Citric Acid, Salt), Humectant (Glycerine), Emulsifiers (Mono- and Di-Glycerides of Fatty Acids, Mono- and Di-Acetyl Tartaric Acid Esters of Mono- and Di-Glycerides of Fatty Acids, Soya Lecithins), Dried Skimmed Milk, Salt, Glucose Syrup, Egg Yolk, Cornflour, Mixed Spice, Cassia, Nutmeg, Preservatives (Potassium Sorbate, Acetic Acid), Colour (Beta-Carotene), Wheat Starch. Contains milk, gluten, wheat, egg, soya and almond. Also, may contain other nuts. For allergens, including cereals containing gluten, see ingredients in bold. Warning: Not suitable for small children who can choke on nuts.Warning: Although every care has been taken to remove cherry stones, some may remain.Warning: This product may occasionally contain small fragments of nut shell.